Unless otherwise stated, these faithful reproductions are within reasonable tolerance of the originals and will fit perfectly in your albums! 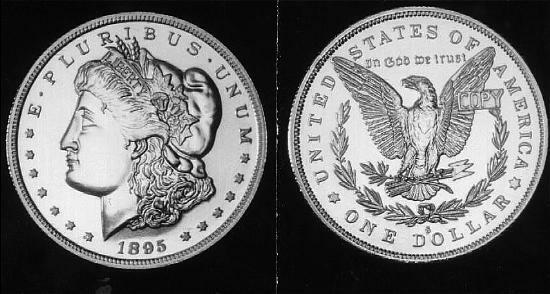 Except for our Gold issues which are gold plated over pure silver -- all other issues are of solid compositions. 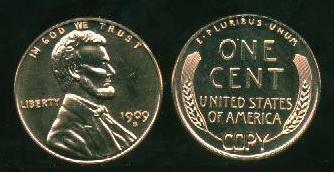 Copper coins are struck in copper, silver in pure silver, nickel in nickel, etc. They look and feel just like the genuine items! Isn't it time to fill those holes? 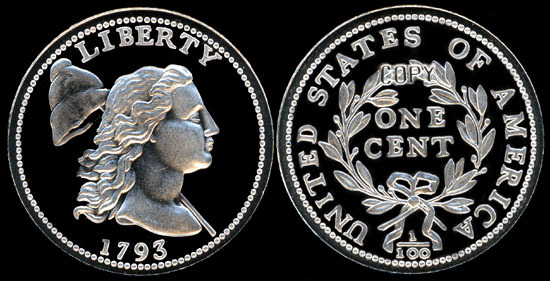 This 1792 United States Silver Center Cent is a faithful reproduction of this classic rarity! 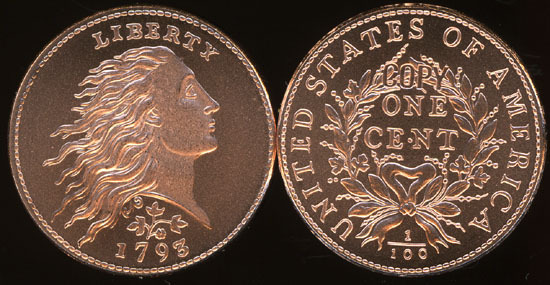 It is one of several denominations of proposed coinage dated 1792. 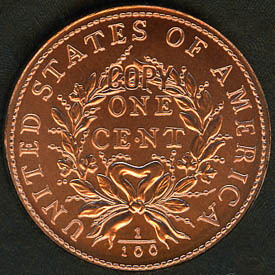 The proposed coinage of that year was of course never actually adopted with all pieces extant now considered rare in any grade. 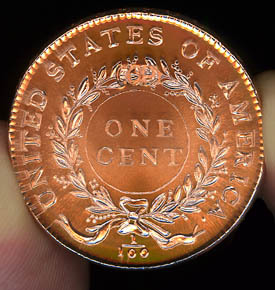 About 13 pieces of the original cents are extant with values ranging from about $100,000 to $300,000 for the known grades. 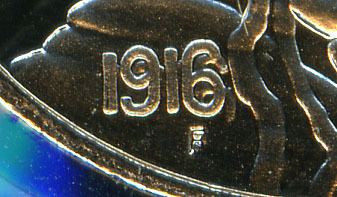 The reverse shows "COPY" neatly worked into the reverse, in accordance with The Hobby Protection Act. 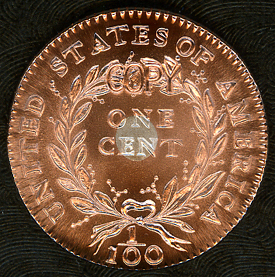 These were struck one at a time with each planchet placed on the lower die by hand. 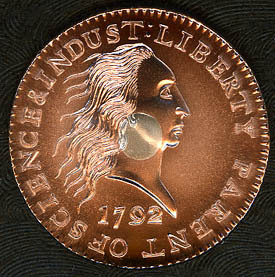 They were also struck without the benefit of a closed collar so that the metal would flow and impart unique characteristics to each coin -- just like original coins of the era. 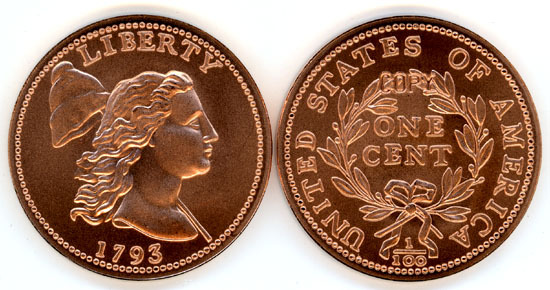 History of the Originals: Only 12 pieces of the original coin were struck in 1861 in copper-nickel by the Philadelphia engraver and die-sinker, Robert Lovett, Jr. After making them, Lovett became terrified that Union officials would find him out and he'd be convicted and sentenced to death for treason. 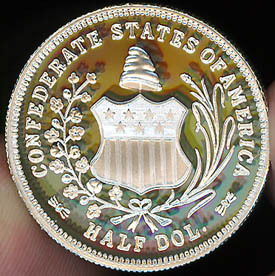 He decided against delivering the dies and coins to the Confederate government and hid them in his cellar (holding just one coin aside as a pocket piece). 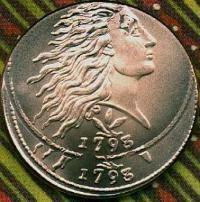 Later, he mistakenly spent his pocket coin in a local tavern and after a bit of coaxing the story became known. 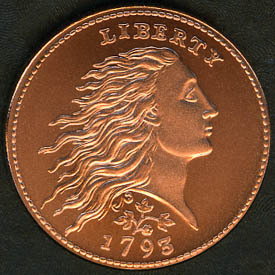 Still later he was talked into selling the coins and dies after which restrikes were made in copper, gold and silver; these are known as the "Heseltine restrikes" named after the maker, Capt. 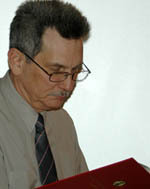 John W. Haseltine. 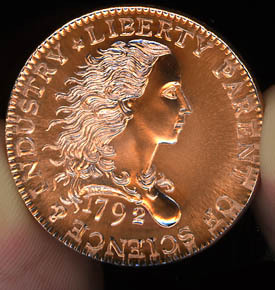 The original copper-nickel and "off metal" restrikes are rare and highly sought-after with prices starting at about $6,000 for the cheapest restrike (the gold is $25,000) up to $30,000 for one of the originals. 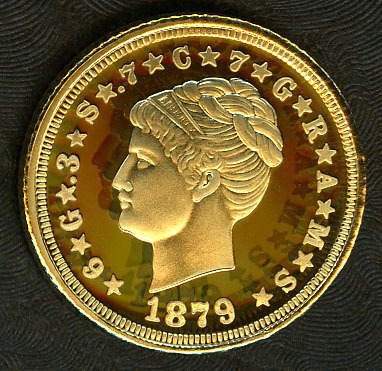 This faithful reproduction of the unique 1870-S $3 gold piece is an outstanding example of one of America's most lengendary coins! 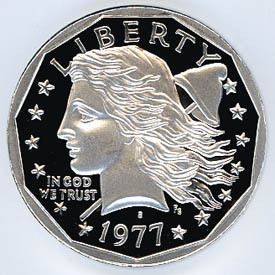 It is struck in pure silver and layered in pure gold. The word copy is neatly worked into the reverse in strict accordance of > The Hobby Protection Act. 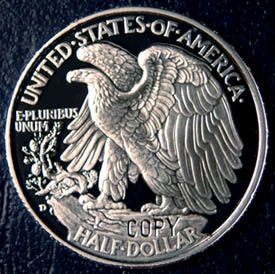 While, you may never be able to own the genuine coin, you can own it as a high quality reproduction from Royal Oak Mint! Isn't it time you filled that hole? 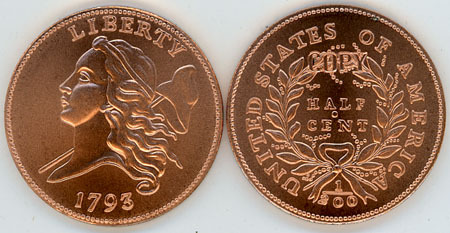 The word "COPY" on the reverse is virtually hidden in the wreath. 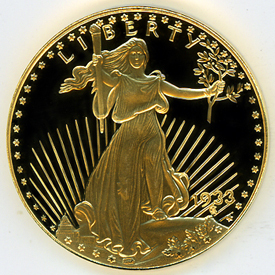 It is 100% precious metal comprised of a layer of 24 karat gold over pure silver! 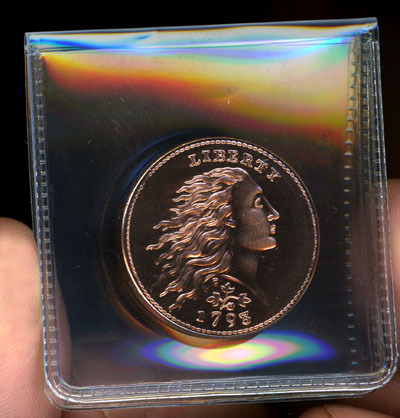 It�s struck to an exact size that will allow it will fit into an album designed to hold a $3 dollar gold piece! If it doesn�t fit � what good is it? 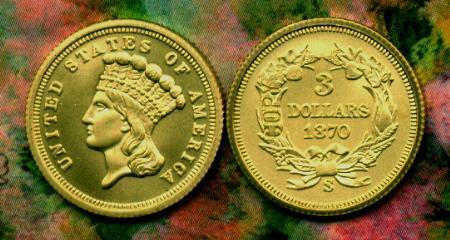 These are faithful reproductions of the 1879 "Flowing Hair" and "Coiled Hair" Types of $4 gold "Stellas." 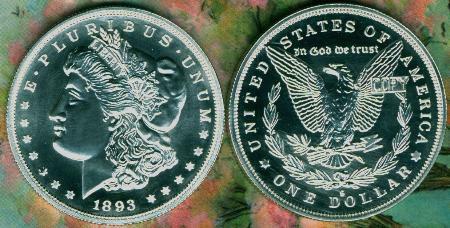 They are outstanding examples of two of America's most legendary coins! 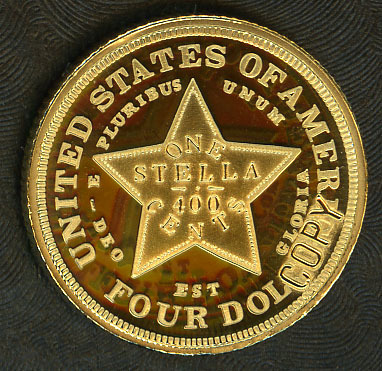 Everybody wants to own a "Stella" but very few can afford one! 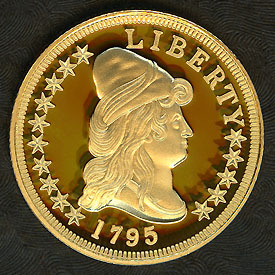 They are struck in pure silver and layered in pure gold. The word copy is neatly worked into the reverse in strict accordance of > The Hobby Protection Act. 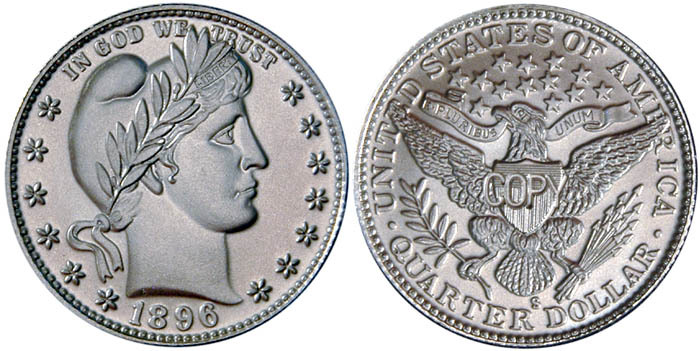 While, you may never be able to own a genuine coin, you can own it as a high quality reproduction from ROM! 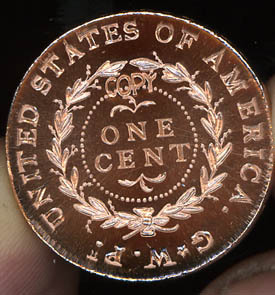 The word "COPY" is neatly worked into the reverse in accordance with the Hobby Protection Act. 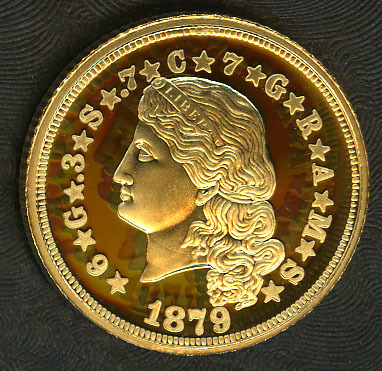 Its struck to an exact size that will allow it will fit into an album designed to hold a $4 dollar gold piece! If it doesnt fit  what good is it? 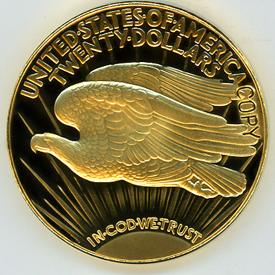 This is a faithful reproduction of the ultra-rare 1933 Saint Gaudens $20 Gold Piece! 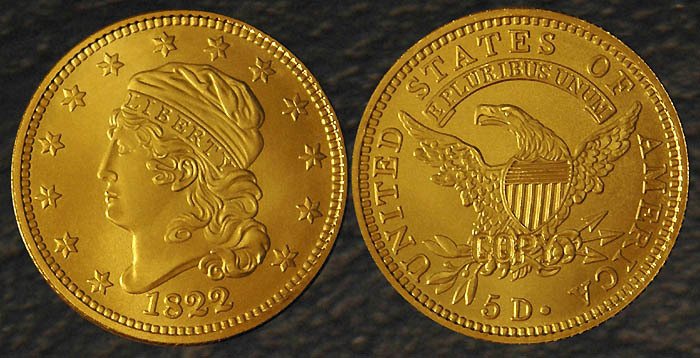 An executive order issued in March of 1933, recalled all common-date gold coins and in effect -- took the United States off the "gold standard" forever. 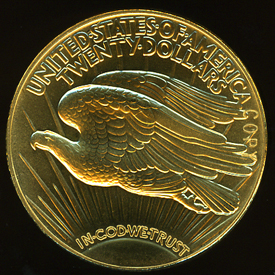 As a result, nearly the entire mintage of 1933 Saint Gaudens Gold $20 Double Eagles was melted by the government! 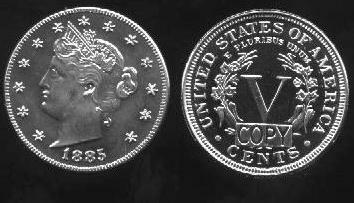 Only a few pieces, then thought to have been clandestinely removed from the Mint, and one other officially given to King Farouk of Egypt, escaped this initial destruction (many or perhaps all of the clandestine pieces have since been seized by the Treasury Department and most presumably destroyed). 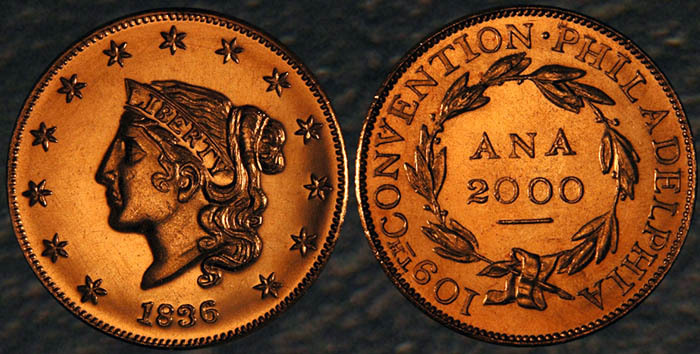 Every collector should have been able to own one of these historic coins and now you can! 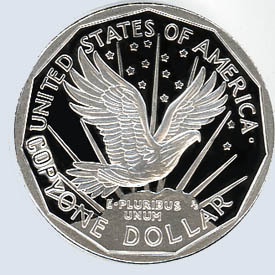 The Royal Oak Mint version is struck on a pure silver planchet that has been double plated in pure 24 karat gold and is of correct diameter (within reasonable tolerances); the reverse shows "COPY" incuse, neatly and inconspicuously worked into the field behind the word AMERICA. It looks like the real thing and it fits perfectly into the collection! Isn't it time for you to fill that hole? 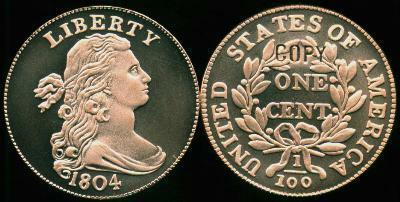 Two other competing reproductions of this coin are currently being marketed but neither will fit into an album! 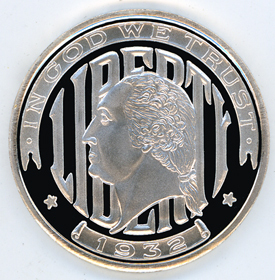 The one being promoted on national television (and newspapers) is offered in a cheaper edition struck with a layer of gold on a cheap base metal planchet which is of 39 mm "silver round size" -- far too large to fit into an album designed to hold a $20 gold piece. 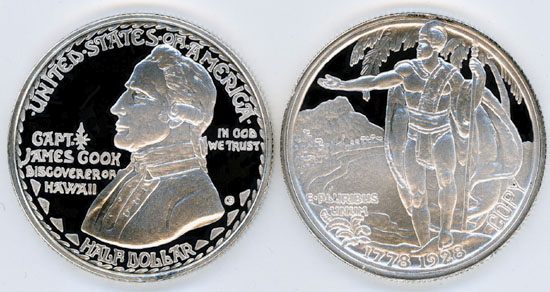 The price of the nationally advertised version is cheaper because the materials are cheap and the tooling and planchet size being used are of the industry standard for silver rounds (and other base metal 39 mm medals). 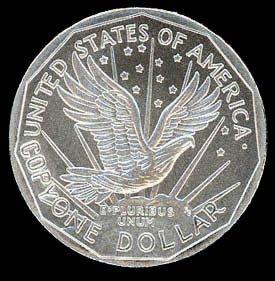 No custom tooling, except for the dies, was produced. When you cut corners and use cheap materials and conform to existing tooling that is of the "wrong size" -- the product reflects it! If it doesn't fit into an album -- what good is it? The nationally advertised version is also being struck in huge numbers! 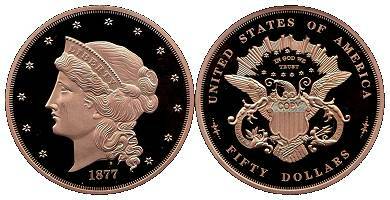 Although the mintages are stated to be low, if you read the "fine print," you will notice they are stated to be low for specific "editions" being offered. 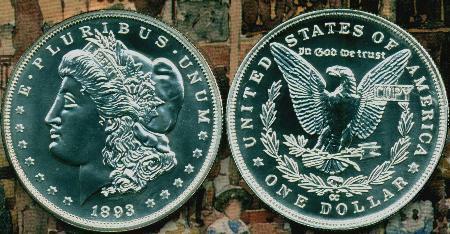 Not stated in the ads is that many "editions" are being struck! 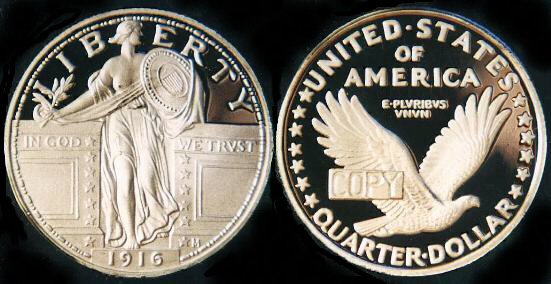 Each "edition" of the nationally advertised version only differs from other "editions" (of the exact same coin) by a different letter (or series of letters) that prefixes the serial number machined into the reverse of each coin! 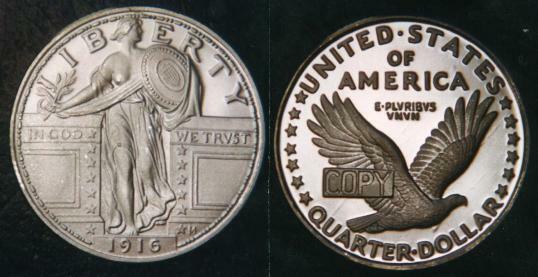 While the nationally advertised version does not show the legally required word, "COPY," on the coin in it's ads -- what it really delivers is a coin with the word "COPY" above a nonsensical alphanumerical serial number, that is machined into the sun below the eagle! 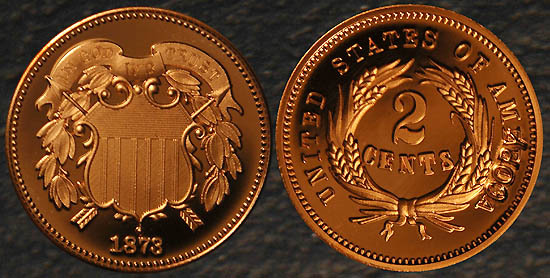 A closer look also reveals that the denomination "TWENTY DOLLARS" does not even appear on the nationally advertised coin -- making it little more than a cheap imitation of the 1933 $20 gold piece! 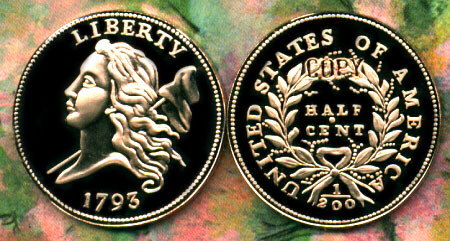 The other competitor-coin is actually quite interesting as it is struck on a 2 oz. 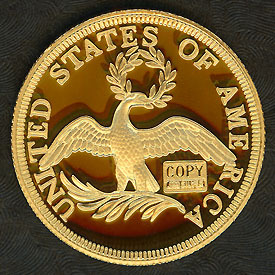 gold plated silver planchet (marked "COPY .999 Silver" on the reverse). 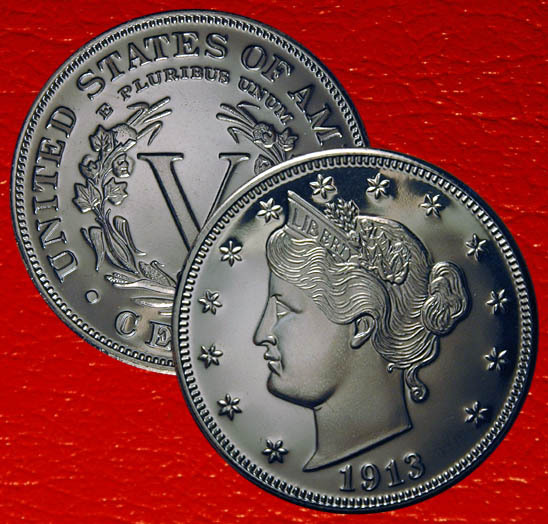 While this one ought to be of interest to silver round collectors, it is obviously over twice the diameter of the genuine item and not suitable for a coin album or the average collector wishing to capture some semblance of the real thing. 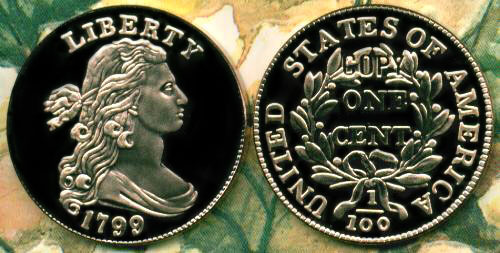 Royal Oak Mint's version is struck with expensive custom tooling to produce this one coin in order to assure the collector that it looks real and will fit into a coin album. 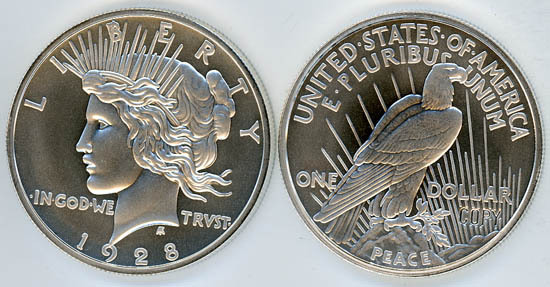 Royal Oak Mint's placement of the legally required word, COPY, is inconspicuously located on the reverse. 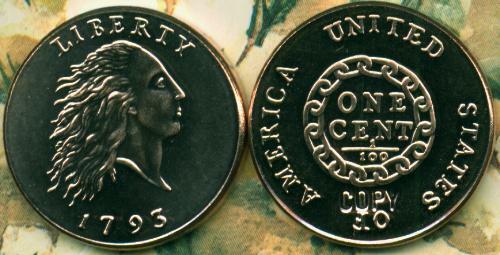 There is no cumbersome statement of purity or pointless, alphanumerical serial numbers to clutter the reverse. The Royal Oak Mint version is struck on pure silver which is layered with a double-thickness of pure 24 karat gold! 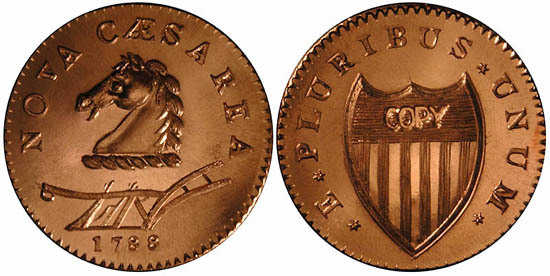 This faithful reproduction of America's first federal gold coin is an outstanding example of a coin that most folks will never be able to afford to own! 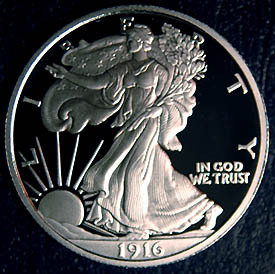 Only It is struck in pure silver and layered in pure gold. The word copy is neatly worked into the reverse in strict accordance of > The Hobby Protection Act. 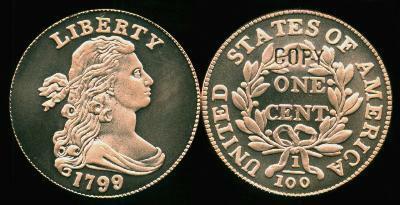 While, you may never be able to own the genuine coin, you can own it as a high quality reproduction! 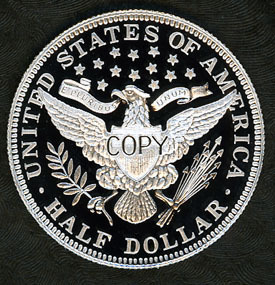 The word "COPY" is neatly worked into the reverse. 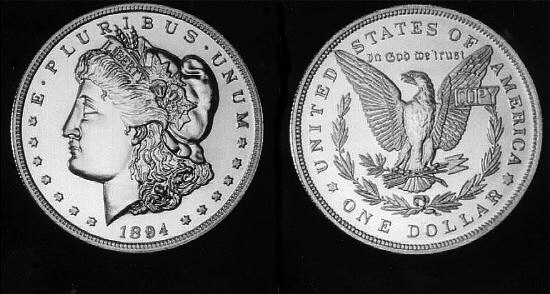 Its struck to an exact size that will allow it will fit into an album designed to hold a $5 dollar gold piece of the era! If it doesnt fit  what good is it? 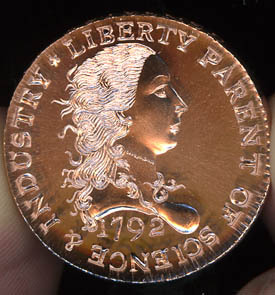 OUR NEWEST REPRODUCTION! 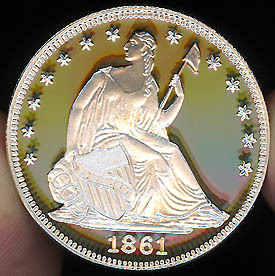 1877 $50 HALF UNION PATTERN COIN! 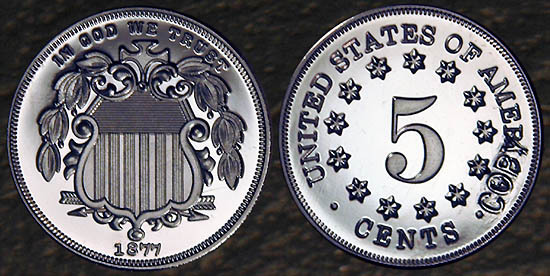 This famous fifty-dollar pattern by William Barber would have been the highest denomination ever issued by the Mint up to that time. 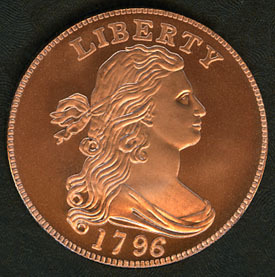 There is only one solid gold specimen known (residing in the Smithsonian), but copper specimens, some gold plated, occasionally come to the market, readily bringing prices ranging from $200,000 to over $300,000. 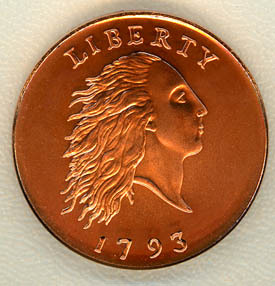 We offer two versions of this great rarity, one 24 karat gold plated over copper, and the second in copper. 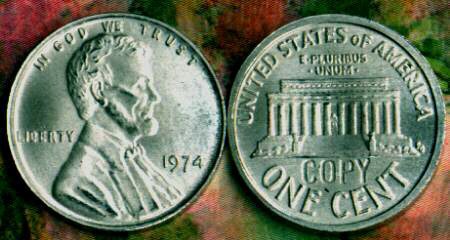 Same content and size as the rare originals. 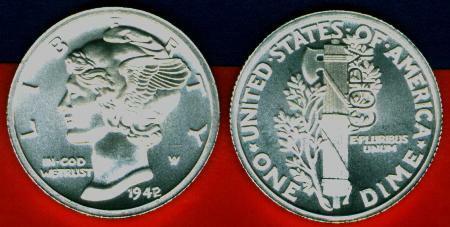 This reproduction's great size and beauty make it a wonderful addition to your collection and a great conversation piece! 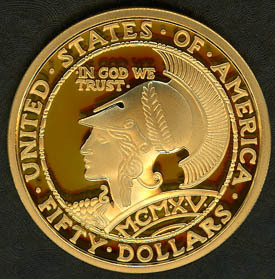 This is a reproduction of the ultra-rare 1915 Commemorative Pan-Pac $50 "Round" Gold Piece! 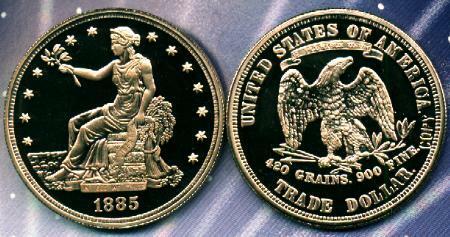 Even in AU grade the original coin starts at around $25,000! 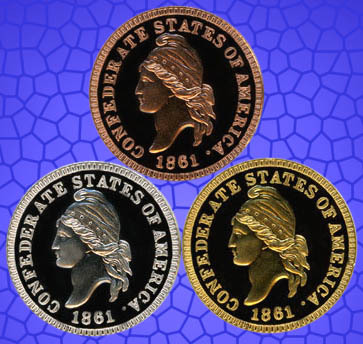 Every collector should be able to own one of these historic coins and now you can as a high quality reproduction! 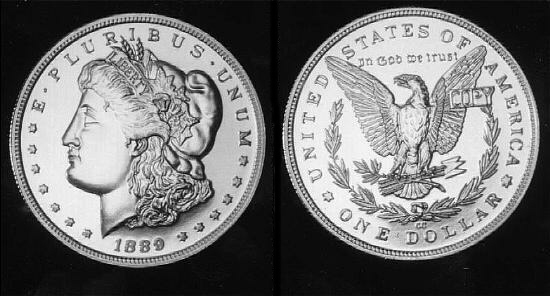 This is an early pattern strike from dies that were prepared for a national marketing company that sold these a number of years ago for well over double our starting bid! 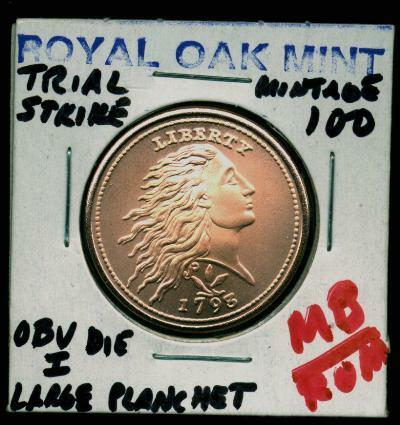 We have been given the opportunity to purchase the early pattern strikes, (that have sat in a vault for a number of years), to sell to our customers. 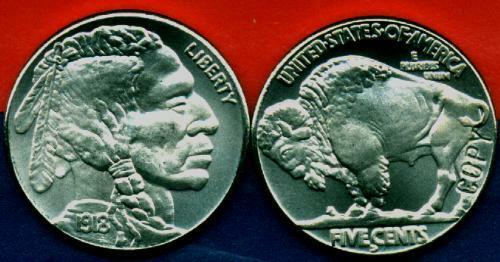 These represent the very first coins that came off of these dies! 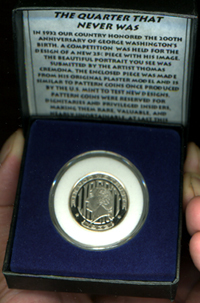 They exhibit extremely sharp, crisp designs and perfect cameo proof devices set against superb mirror-like fields. 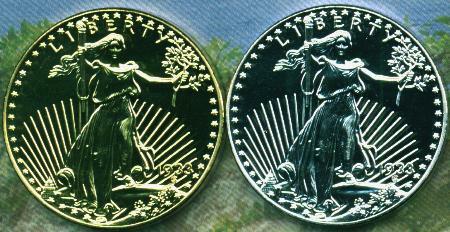 They are 42 mm in diameter and are struck on a pure silver planchet that has been plated in pure 24 k gold! 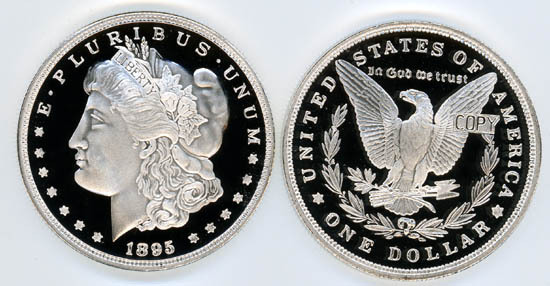 The word "COPY" (required by the Hobby Protection Act) is incuse over the statement ".999 SILVER" and is neatly worked into the reverse design. 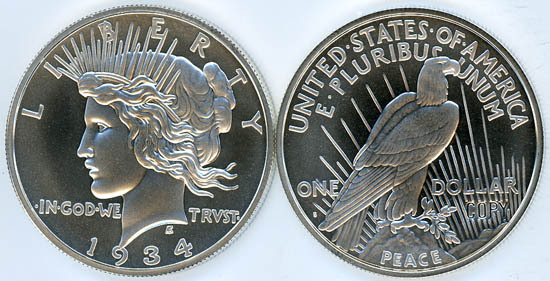 The edge is reeded with a with an area noting that it is a PATTERN engraved into the edge. We have been told than only a couple of hundred pattern strikes of these were made. 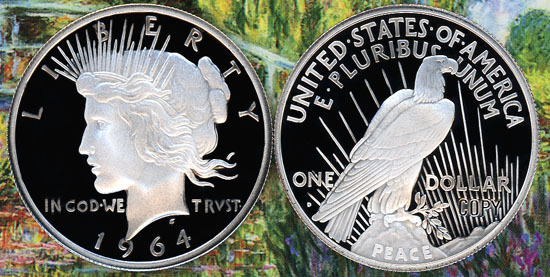 This is the Royal Oak Mint's "exact size" reproduction of their first attempt at a Morgan Dollar Obverse "muled" with a Peace Dollar Reverse. 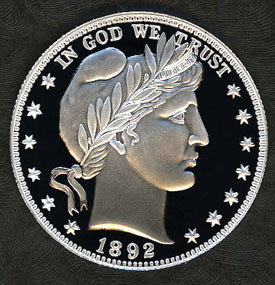 On this attempt, ROM ultimately decided that the production department had created this rarity with an obverse die that was a bit too worn (it shows a bit of weakness in the hair due to die polishing and use) and rejected the coins (and then created a new obverse die for future strikings of their 1895 Branch Mint coins). 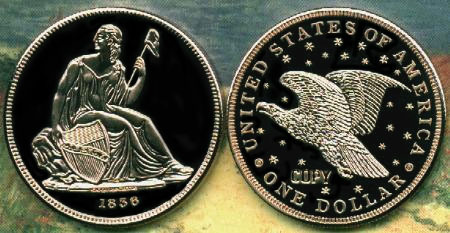 Interestingly, they never returned to the concept of creating a business strike version of a Morgan/Peace Dollar Mule -- though they later settled on creating both a Morgan/Peace and Peace/Morgan Mule in Cameo Proof ( which we will also be offering as soon a time permits us to get them into the listings -- or just email me for a price). 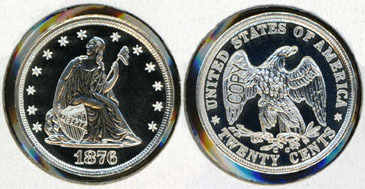 ROM has indicated that they will never make more mules of this coin and that the total mintage is set at 20 pieces worldwide. 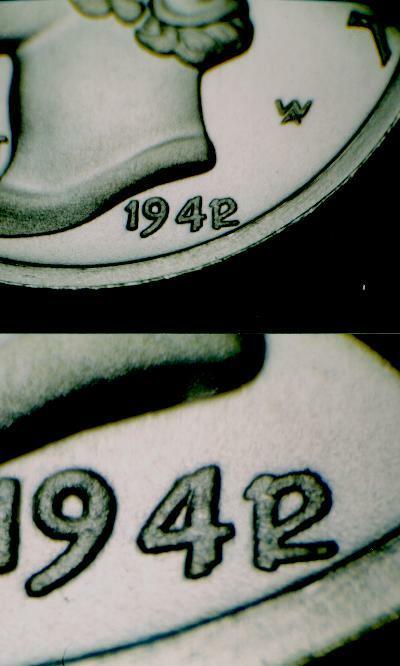 Of that mintage, 15 were left, (five were given away), sitting on a tray destined to be returned to the production department, along with about 200 coins, for destruction. 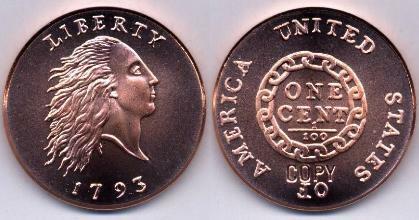 Before doing so, ROM allowed me to review the batch of 200+ coins and offered to sell any that I wanted at a reduced price. 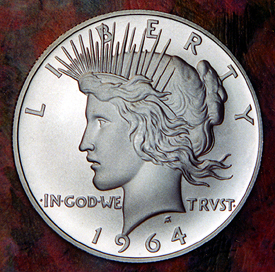 Originally my intent was to find some of the rejected MS63/64 dollars, (ROM only delivers MS65 or better), for use in jewelry and belt buckles. After buying all of these, I was shown the "Mules" and decided to buy every one of them too. Even if they were a bit weak in hair detail, I knew that some of the die-hard ROM fans would want one! 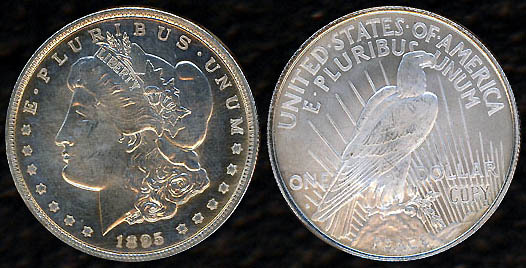 Since the coins were left out sitting on a tray for well over a year, some that were near a window have developed very nice toning while others are still perfectly white. 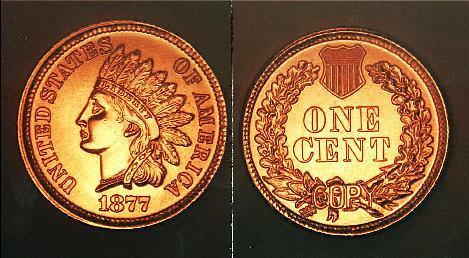 We show an example of the toned pieces simply because they scan better. You may ask for a toned version or a brilliant version. 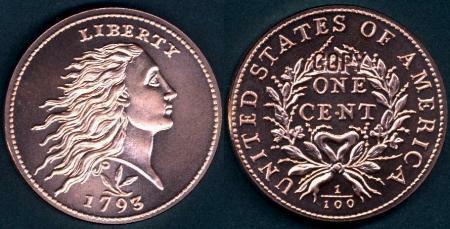 All of these coins will grade MS65 or better. 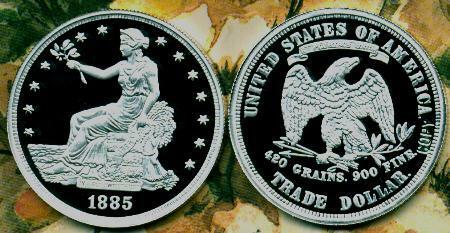 Get yours at just $85.00 while the small supply lasts! 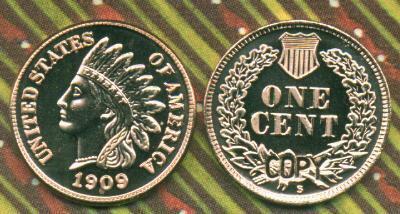 Mintages of Just 20 Each -- No more will be made! 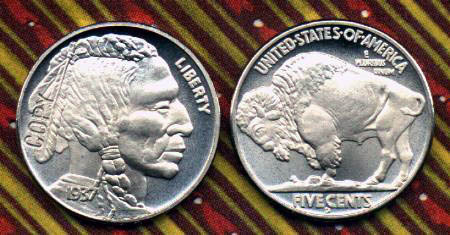 Your pick at just $95.00 each. 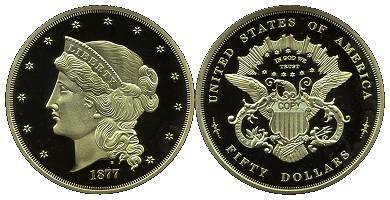 Ever since Royal Oak Mint first issued the 1856 Flying Eagle Cent reproductions, a segment of our buyers have been asking if any of the non-silver issues will ever be struck in a special edition of silver. 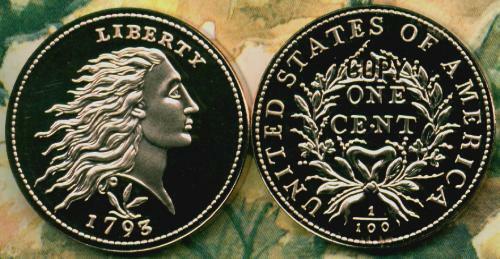 In response to that demand ROM has decided to issue all the cents in .999 fine silver. 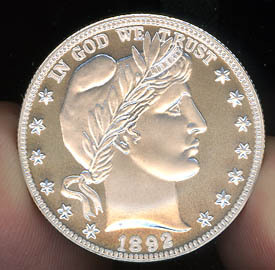 The following dates are now available in silver: 1793 Chain, 1793 Wreath, 1793 Liberty Cap 1799, 1804, 1856, 1877 Proof, 1909-S Indian Head Proof, 1909-S Lincoln, 1909-S VDB, 1914-D, 1922 No D, 1943-D, 1944, 1955/55 Doubled Die and 1974. 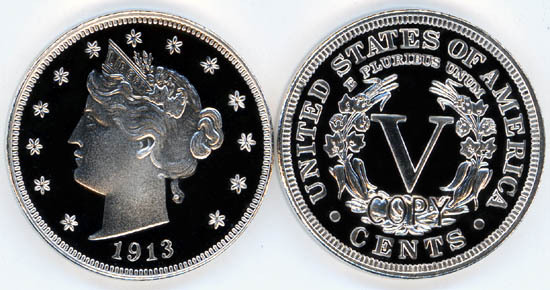 The mintage on these coins is strictly limited to 100 pieces. No more will be made. 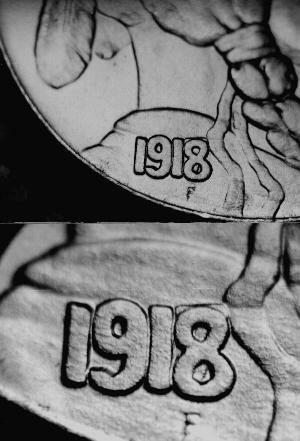 Most folks have no idea of the time and expense ROM goes through to produce dies they deem acceptable for their rare-coin-reproductions. 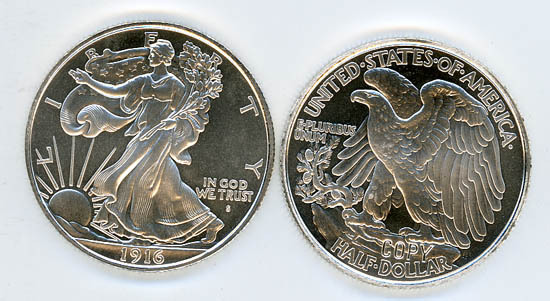 ROM's 1921 Walking Liberty half dollars (which they made for all three Mints) is a prime example. 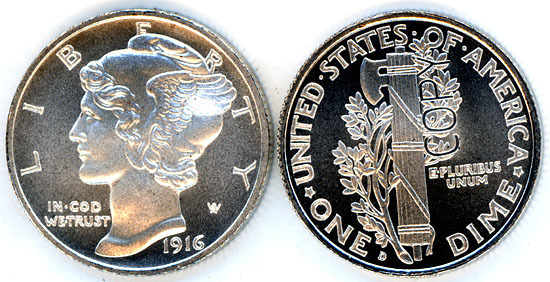 ROM had to make three obverse dies for the 1921 WLH before an acceptable die was produced. 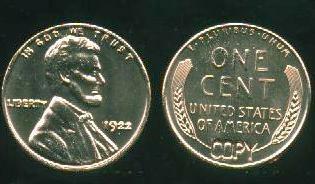 Of those three dies, four distinct obverse varieties were made. 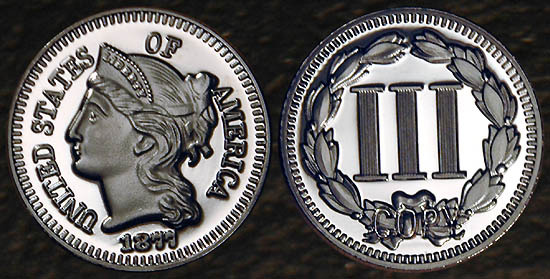 Die pair 1 was created with designs and fields that were too flat and both dies and were rejected with only 10 trial strikes made for each of the three Mints (P, D, S). 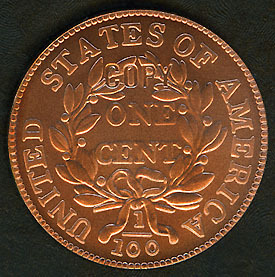 Die pair 2 resulted in an acceptable reverse but an obverse that had the date entered into the die at a slight angle as if in italics and was rejected, again with only 10 trials made for each Mint. 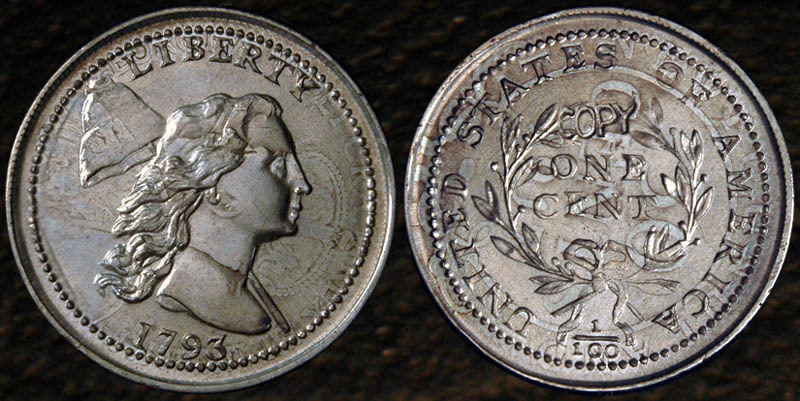 Undoubtedly the most interesting were those ROM ordered the production department to strike of their third version of the obverse. 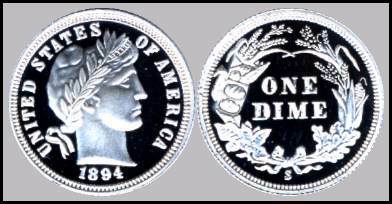 To make Die pair 3, Obverse Die 2 was sent to a NY firm that specializes in die repair who welded in the date with a patch for D2 steel. 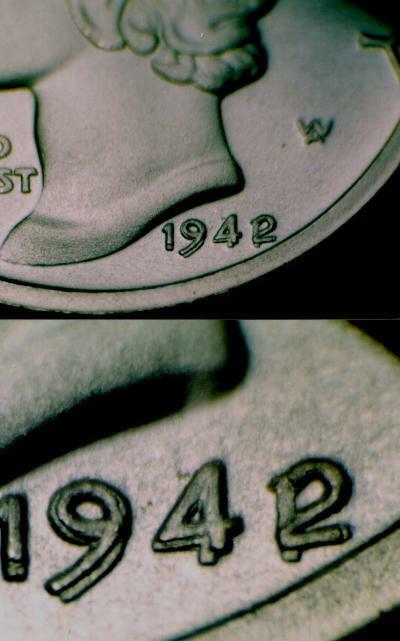 The die was then send to an engraver for finishing and reentry of the date. 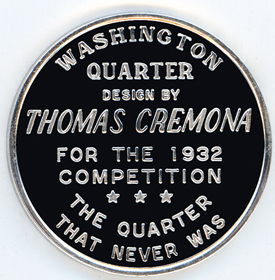 After that the die was sent to the heat treater and then back to the production department where thirty-five trials were ordered struck struck with just one reverse. 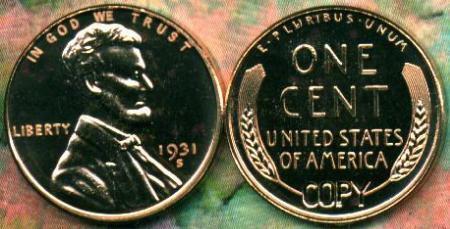 To the dismay of ROM, it came in with a larger than normal date! 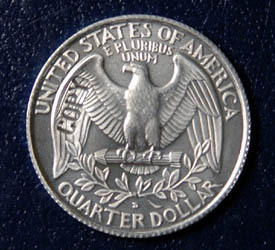 Thus, that obverse die, like its predecessors, was ultimately rejected. 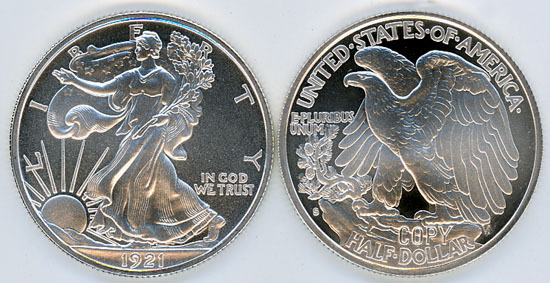 Even stranger though, was the fact that the production department mistakenly struck the trials for Die pair 3 with the Commemorative Hawaiian half dollar reverse that was on hand. 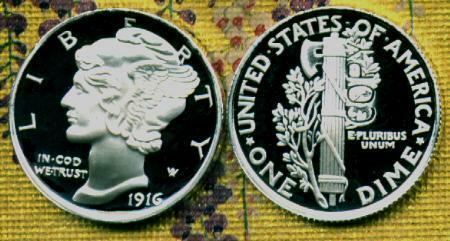 Thus, ROM's Die pair 3 (or Ty-3 if you prefer) 1921 Walking Liberty half obverse w/Large Date is only available with a Hawaiian reverse! 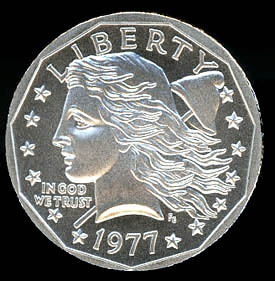 Apparently, nobody in the production department remembered what the reverse for the WLH looked like! 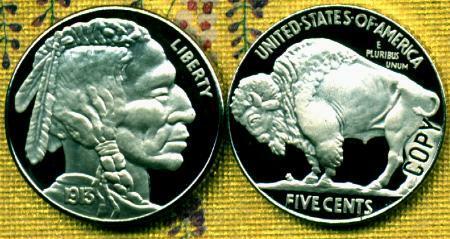 It is a true "mule" made in error and no more will be made. 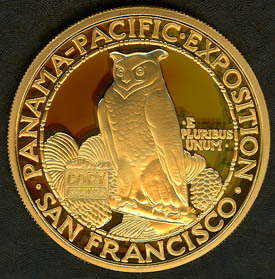 We have several available at ROM's official price of $65.00 each. 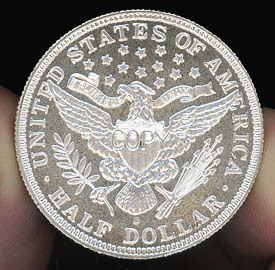 So Large it is Nearly 10x Heavier than a Real Nickel! Image � Ken Potter 2008 - Not to be used without permission. 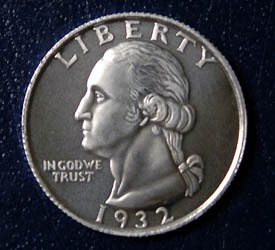 1936 U.S. Government Proof Set Tribute in case by National Collectors Mint.